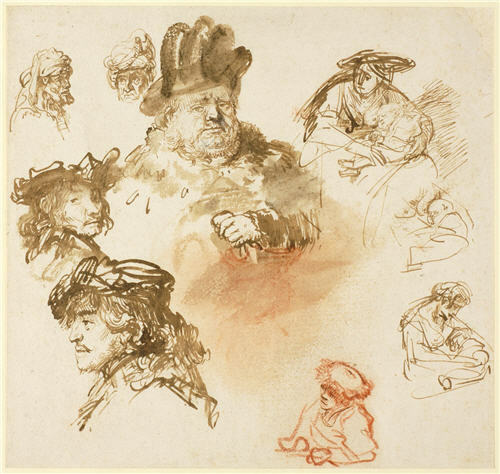 This sheet contains nine studies of five different figures and is the finest such drawing by Rembrandt to survive intact. Rembrandt was renowned for carrying a sketchbook around Amsterdam in which he would rapidly draw anything that aroused his curiosity. 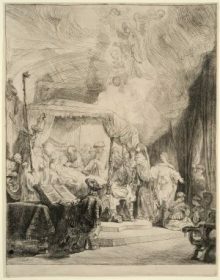 In this case, he draws a plump man wearing a fur coat and a plumed hat, a man in a turban, a woman nursing her child and a youth leaning on a ledge. The use of three different media and the careful placing of the studies on the sheet suggest that the drawing was made as a deliberate demonstration of the artist’s skill.